Announcement Did you see our Custom-made Penguin in the Greenpeace Campaign? 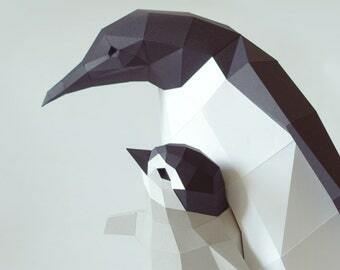 Did you see our Custom-made Penguin in the Greenpeace Campaign? Took about a day to glue them together but it was a fun day and the instructions were clear. Would absolutely buy again. Great design and quality ... As Always ! Looking good with white teeth! Formerly my wall croc was planned without teeth. Now I'm glad I added this extra little detail. Playing with the prototype. Yet the yaw isn't connected. 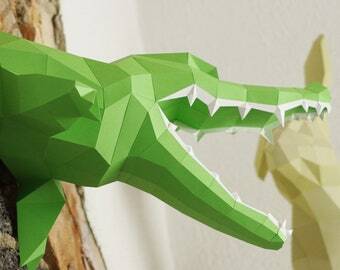 Paperwolf's crocodile! My brother bought 3 art canvas prints for his living room. 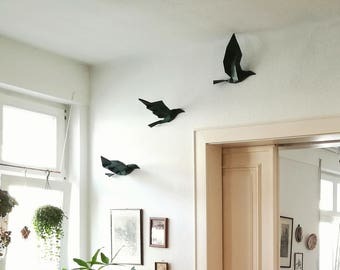 This inspired me to mount my birds on the pictures. I think this is perfect and looks like an Intentional product! Working as Freelance Computer Animator, Wolfram Kampffmeyer lives with his wife and two little children in Aach, southern Germany. He loves bringing animals to life. Not only inside the computer. 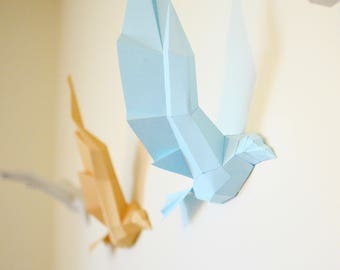 His passion is creating new paper sculptures with lively expressions. 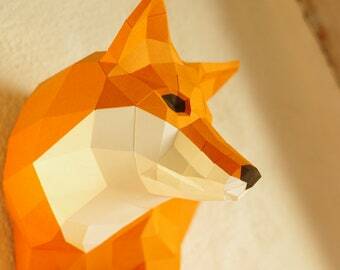 Since 2010 he creates new animals under his label Paperwolf. 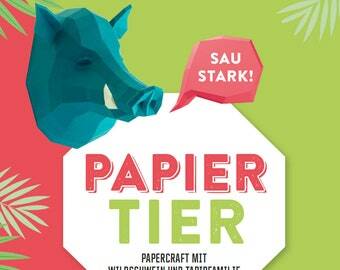 No matter if deer, lion, monkey or meerkat - there is nothing he can't design from paper. 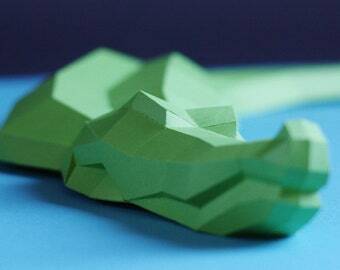 His paper zoo grew from year to year from a llittle idea up to a second profession. Wolfram Kampffmeyer's zoo is loved world-wide and every year new animals join the zoo - always then when a new idea squeezes it's way out of his head, urging to the surface of reality. His creations sand out due to their high but still foldable amount of detail. 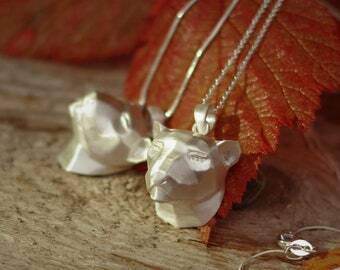 The line flow follows and emphasizes the anatomical features of the animal, each polygon is placed by hand with care. This creates a style which is aswell modern as fitting to the medium paper. The result are animals which are room decoration, gifts, art and great calming projects for your leisure time! But also proud and animal-loving alternative trophies of your own creativity! I'm Wolfram Kampffmeyer. Born 1982. Studied Computer Animation. 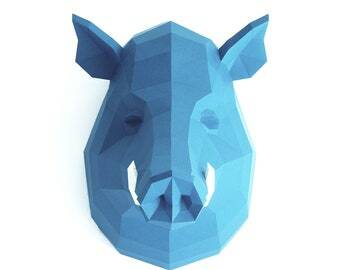 I'm creating virtual 3D make paper sculptures out of it. End of 2016 I've moved to Aach (Hegau) into my own little Villa Kunterbunt. Ein kleiner indischer Schmuckfabrikant fragte mich vor einiger Zeit, ob ich für ihn eine geometrische Lakshmi-Statue entwerfen könnte, die er dann aus Silber herstellen wollte. Aus diesem kleinen Gefallen erwuchs eine wunderschöne Kooperation über Grenzen hinweg! My local stamp maker engraves my stamp motives out of rubber with his special laser cutter. I then separate the motives from the big rubber plate with small scissors. They print my postcard motives on postcard cardboard and send it via postal service to me. Diese Datenschutzerklärung informiert Dich darüber, wie Paperwolf Deine personenbezogenen Daten im Zusammenhang mit einem Bestellprozess erhebt, verarbeitet und nutzt. Für Deine Nutzung der Dienste von Etsy gilt unabhängig hiervon die Datenschutzerklärung von Etsy. 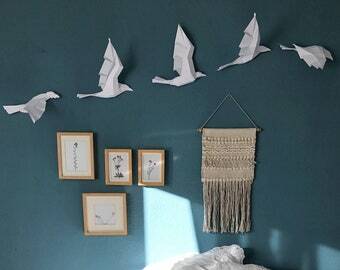 Nach jeder von Dir getätigten Bestellung erhält und verarbeitet Paperwolf für die Zwecke der Abwicklung der Bestellung Deinen Namen, Deinen Etsy-Nutzernamen und Deine Rechnungsanschrift, wie sie in Deinem Nutzerkonto hinterlegt ist. Soweit Du im Rahmen Deiner Bestellung weitere Daten angibst (z. B. abweichende Lieferadresse oder Deine Telefonnummer) erhält Paperwolf auch diese Daten. Paperwolf verarbeitet diese Daten elektronisch zur ordnungsgemäßen Vertragserfüllung, insbesondere für die Rechnungsstellung, die Verbuchung von Zahlungen und den Versand bestellter Waren an Dich. Sofern notwendig, gibt Paperwolf Deinen Namen und Deine Anschrift an ein beauftragtes Versandunternehmen weiter. Paperwolf hält Deine Daten so lange gespeichert, bis alle gegenseitigen Ansprüche aus Deiner Bestellung vollständig erfüllt sind und die Fristen der handels- und steuerrechtlichen Aufbewahrungspflichten für Paperwolf abgelaufen sind. Du kannst von Paperwolf jederzeit Auskunft über die personenbezogenen Daten verlangen, die Paperwolf über Dich gespeichert hat. Zudem kannst Du jederzeit die Berichtigung, Sperrung und Löschung Deiner personenbezogenen Daten verlangen. Bei allen Fragen zum Datenschutz kannst Du Paperwolf per Email unter sales@paperwolf.de kontaktieren. Datenschutzerklärung 1. Geltungsbereich Diese Datenschutzerklärung informiert Dich darüber, wie Paperwolf Deine personenbezogenen Daten im Zusammenhang mit einem Bestellprozess erhebt, verarbeitet und nutzt. Für Deine Nutzung der Dienste von Etsy gilt unabhängig hiervon die Datenschutzerklärung von Etsy. 2. Umgang mit personenbezogenen Daten Nach jeder von Dir getätigten Bestellung erhält und verarbeitet Paperwolf für die Zwecke der Abwicklung der Bestellung Deinen Namen, Deinen Etsy-Nutzernamen und Deine Rechnungsanschrift, wie sie in Deinem Nutzerkonto hinterlegt ist. Soweit Du im Rahmen Deiner Bestellung weitere Daten angibst (z. B. abweichende Lieferadresse oder Deine Telefonnummer) erhält Paperwolf auch diese Daten. Paperwolf verarbeitet diese Daten elektronisch zur ordnungsgemäßen Vertragserfüllung, insbesondere für die Rechnungsstellung, die Verbuchung von Zahlungen und den Versand bestellter Waren an Dich. Sofern notwendig, gibt Paperwolf Deinen Namen und Deine Anschrift an ein beauftragtes Versandunternehmen weiter. Paperwolf hält Deine Daten so lange gespeichert, bis alle gegenseitigen Ansprüche aus Deiner Bestellung vollständig erfüllt sind und die Fristen der handels- und steuerrechtlichen Aufbewahrungspflichten für Paperwolf abgelaufen sind. Sofern Du für die Bezahlung bestellter Waren auf Dienste Dritter, insbesondere Zahlungsdienste, zurückgreifst (z. B. PayPal und Kreditkartendienste), gilt hierfür die jeweilige Datenschutzerklärung solcher Dritten. 3. Rechte und Kontakt Du kannst von Paperwolf jederzeit Auskunft über die personenbezogenen Daten verlangen, die Paperwolf über Dich gespeichert hat. Zudem kannst Du jederzeit die Berichtigung, Sperrung und Löschung Deiner personenbezogenen Daten verlangen. Bei allen Fragen zum Datenschutz kannst Du Paperwolf per Email unter sales@paperwolf.de kontaktieren. Right of withdrawal You have the right to withdraw from this contract within 14 days without giving any reason. The withdrawal period will expire after 14 days from the day on which you acquire, or a third party other than the carrier and indicated by you acquires, physical possession of the goods. To exercise the right of withdrawal, you must inform us (Paperwolf, Wolfram Kampffmeyer, Alter Turmweg 3, 78267 Aach, Tel. : 0174-6744482, E-Mail: paperwolf.productions@gmail.com) of your decision to withdraw from this contract by an unequivocal statement (e.g. a letter sent by post, fax or e-mail). You may use the attached model withdrawal form, but it is not obligatory. To meet the withdrawal deadline, it is sufficient for you to send your communication concerning your exercise of the right of withdrawal before the withdrawal period has expired. Effects of withdrawal If you withdraw from this contract, we shall reimburse to you all payments received from you, including the costs of delivery (with the exception of the supplementary costs resulting from your choice of a type of delivery other than the least expensive type of standard delivery offered by us), without undue delay and in any event not later than 14 days from the day on which we are informed about your decision to withdraw from this contract. We will carry out such reimbursement using the same means of payment as you used for the initial transaction, unless you have expressly agreed otherwise; in any event, you will not incur any fees as a result of such reimbursement. We may withhold reimbursement until we have received the goods back or you have supplied evidence of having sent back the goods, whichever is the earliest. You shall send back the goods or hand them over to us, without undue delay and in any event not later than 14 days from the day on which you communicate your withdrawal from this contract to us. The deadline is met if you send back the goods before the period of 14 days has expired. You will have to bear the direct cost of returning the goods. You are only liable for any diminished value of the goods resulting from the handling other than what is necessary to establish the nature, characteristics and functioning of the goods. The right of withdrawal expires for custom-order products and big size trophies (Deer, Bear Elephant, Horse, Lion etc). No withdrawal for other than standard colors for my paper sculptures. Standard colors are those in which the sculptures were built and photographed as example in the product pictures.